Telescope Casual features a versatile patio furniture collection that consists of a variety of different styles and materials. Since 1903, Telescope Casual has been manufacturing world-class luxury patio furniture that is made in the USA. From their manufacturing plant located in New York, Telescope is constantly improving in the research, development, and engineering process of making quality outdoor furniture. Telescope remains committed to being an industry pioneer by introducing new innovations and products, while preserving their well deserved reputation for high quality furniture. Telescope Casual Director Chair is soundly constructed using the finest kiln-dried solid North American hardwood. Made in the U.S.A.. it folds compactly for easy storage. Hardware used on this chair is zinc-plated for strength and protection from rusting. Washable, colorfast canvas covers are available in several colors. The covers are snag resistant. All wood parts are precision milled, pressed together and nailed for maximum rigidity. Chair has extra heavy-duty, corrosion-resistant, zinc-plated steel braces. The extra-strong let braces are nailed securely into the legs. Chairs have self-leveling plastic glides on the legs to help prevent marring of floors. The screws make these glides easily replaceable. The seating material slips into a specialty designed groove and no tools are needed. 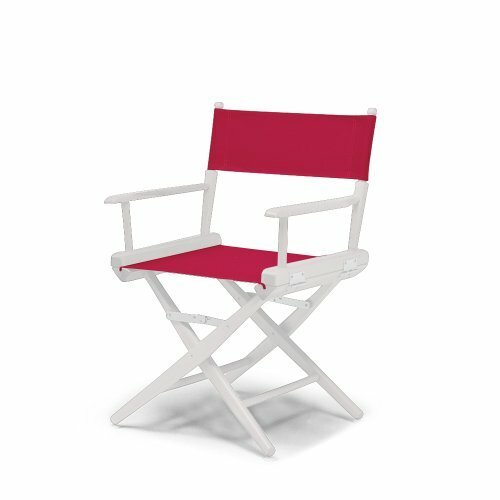 All back covers have a non-sag feature, one size seat and back fits all director chairs.